Matt took me to Lucky Bucket Brewing while I was in Omaha. Their lager and IPA see a pretty wide distribution in at least Nebraska and Iowa, and they brew a number of other beers of varying availability. 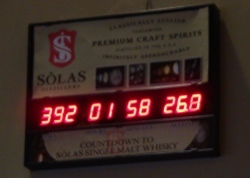 The distillery arm Sòlas makes a vodka from Nebraska wheat and they have their first single-malt whisky aging in barrels now. The bartender was making a Black & Tan with an unnamed barleywine and Certified Evil, their Belgian strong ale. A creamy dark tan head atop an almost black layer of barleywine, itself surmounting, perhaps precariously, the ruby copper, barely hazy Evil. 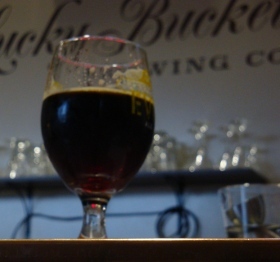 The barleywine is predictably most of the aroma: a rich dry burnt character, roasty and toasty. The flavors present a great combination. The barleywine has a strong roasted flavor that balances the caramel sweetness of the Evil. A bit of alcohol is apparent, adding a little spiciness. The body is rich and full, but it is not thick. This is a very complex, flavorful, and drinkable combination. I also tasted their Joss vodka. They run it through their giant pot stills and then into a 23 plate column still that’s probably as many feet tall. It is perfectly clear and colorless. The aroma is neutral alcohol. There is a clean, gentle warming to the flavor. There is also a sweetness perhaps due to the wheat. This entry was posted on Wednesday, January 11th, 2012 at 22:54	and is filed under American Ale, Brewery Visit, Strong Beer. You can follow any responses to this entry through the RSS 2.0 feed. You can leave a response, or trackback from your own site. The copper colored beer was the barleywine. So it was. I am a bit embarrassed to find that I got it backwards. In my defense I’ve never had the chance to have Certified Evil alone. Is it usually that dark, dry, and roasty? It seems strange to me then to call it a Belgian strong ale. But that sure puts the barleywine more squarely in that style category. Thanks for the correction!